Manchester City passed up the chance to go clear at the top of the table after missing a late penalty in the 0-0 draw with Liverpool at Anfield on Sunday. Mohamed Salah, Roberto Firmino and Sadio Mane hardly had a look-in for Jurgen Klopp's side as City coped well with their dangerous front three. Riyad Mahrez could have won it for the defending champions late on when they were awarded a penalty, but he lashed the ball into the stand behind goal from the spot. The Citizens remain in pole position, but they are in a three-way tie with the Reds and Chelsea at the Premier League summit going into the international break. But given the quality in attack at both ends, the final product was often lacking with just one clear-cut chance coming before half-time. Salah found some space on the right in the fourth minute after latching onto Firmino's forward header, but he fired wide of the near post from 16 yards out. After Fernandinho blasted an ambitious long-range effort high and wide of the right post in the 58th minute, Mahrez collected David Silva's through-ball on the left and went past Andrew Robertson before fizzing a low shot inches wide of the target from 12 yards out on 61 minutes. The Algerian winger drew a routine save out of Alisson moments later with an angled strike on his weaker foot on the right, and the action quickly switched to the other end as Salah took one touch from Joe Gomez's square pass before curling into the arms of Ederson from 17 yards out. The Egyptian star lacked composure in the 69th minute when he brought down Andrew Robertson's long ball with a fine touch and blazed over from inside the area on the left. 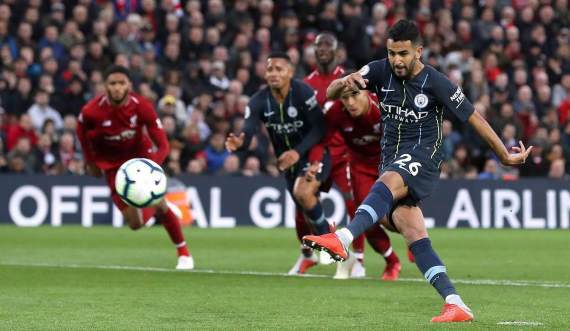 Mahrez went close again six minutes later as he forced Alisson into a sharp save at his near post with a low strike from 12 yards out on the right, while at the opposite end of the pitch substitute Daniel Sturridge couldn't generate enough power on his header to trouble Ederson on 79 minutes. City had a glorious opportunity to take the lead five minutes from time when Virgil van Dijk brought down Leroy Sane inside the box as the German winger raced onto David Silva's through-ball on the left. However, Mahrez failed to punish the Dutch defender as he cleared the crossbar from 12 yards out to gift the Reds a share of the spoils.